Edvard Grieg was a Norwegian composer and pianist. He is widely considered one of the leading Romantic era composers, known for being both nationalistic and cosmopolitan, with his music as part of the standard repertoire worldwide. Just as his contemporaries Sibelius and Dvorak did for their mother countries of Finland and Bohemia, respectively, Grieg put the music of Norway on the international spectrum when he used and developed traditional folk tunes in his compositions. Traveling the continent motivated him to express the beauty not only of rural Norwegian life, but also the culture of Europe as a whole through his music. Grieg was born in Bergen in 1843. His father was a merchant and vice-consul in Bergen and his mother was a music teacher. Grieg first learned piano with her at age six and studied in several schools, including the Norwegian Private School. In the summer of 1858, he met Ole Bull, the premiere violinist of Norway and a family friend. Bull immediately recognized the boy’s musical talents and eventually persuaded his parents to send young Grieg to the Leipzig Conservatory. It was there he concentrated on the piano, and enjoyed the many concerts and recitals given in Leipzig. In the spring of 1860, Grieg survived a life-threatening lung disease, pleurisy, and tuberculosis which left permanent damage to plague the musician throughout his life. His poor health did not stop him however, for in 1861, he made his debut as a concert pianist in Sweden. The following year, he finished his studies in Leipzig and held his first concert in his home town, including Beethoven’s Pathetique sonata on the program. In 1863, Grieg moved to Copenhagen, Denmark for three years. He met Danish composers Hartmann and Gade, as well as fellow Norwegian composer Nordraak (composer of the Norwegian national anthem), who became a good friend and source of inspiration. When Nordrakk died in 1866, Grieg composed a funeral march in his honor. On June 11, 1867, Grieg married his first cousin, Nina Hagerup, a lyric soprano. The next year, their only child, Alexandra, was born. She lived a very short life, passing away from meningitis in 1869. 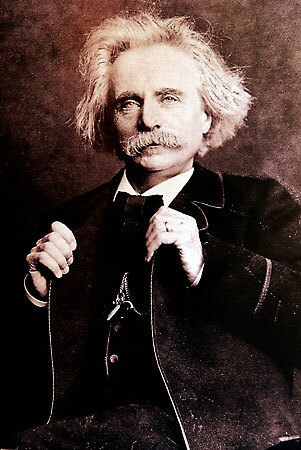 Grieg met Liszt in Rome in 1870 when he obtained a travel grant after Liszt wrote a testimonial on his behalf, even though the two had never previously met. Upon their first meeting, they went over Grieg’s Violin Sonata No. 1, which Liszt enjoyed immensely. Months later the composers met again and Grieg brought the manuscript of his Piano Concerto, which Liszt sight-read and offered suggestions regarding orchestration. Years later, Grieg also met Tschaikowsky, who thought very highly of his music, praising its beauty, originality and warmth. The mid-1870s was marked by Grieg’s work on the incidental music for the premiere of Henrik Ibsen’s play Peer Gynt, at the request of the author. Grieg had close ties with the Bergen Philharmonic Orchestra, and took on the role of Music Director from 1880 to 1882. In his lifetime, Grieg was awarded two honorary doctorates, first by Cambridge University in 1894 and the next from Oxford University in 1906. Grieg died in Bergen, Norway from heart failure in late summer 1907, his final words being “Well, if it must be so.” The funeral drew between 30 and 40 thousand people since he was the city’s most celebrated resident in history. Following his wishes, his own Funeral March in Memory of Rikard Nordraak was played in an orchestration by his friend Johan Halvorsen. In addition, the Funeral March movement from Chopin’s Piano Sonata No. 2 was played. Grieg was cremated, and his ashes were entombed in a mountain crypt near his house, Troldhaugen, where the ashes of his wife were later placed as well. Some of Grieg’s works include a symphony (which he later suppressed), a piano sonata, three violin sonatas, and a cello sonata, as well as songs in which he set lyrics by poets such as Heine, Goethe, Ibsen, Andersen, and Kipling. His popular Holberg Suite was originally written for the piano, and later arranged by the composer for string orchestra. Grieg will forever be remembered for the beauty of his music which brought international recognition to Norway and joy to countless concert audiences.